If Weather.com is to be believed it was 37 degrees this morning. If my ability to not wear a jacket and walk to the store and actually sweat a little is to be believed I'm guessing it was closer to 57 degrees this morning. I was a little worried that tonight's dinner plans (which involved running the oven for three to four hours) may be ill advised. 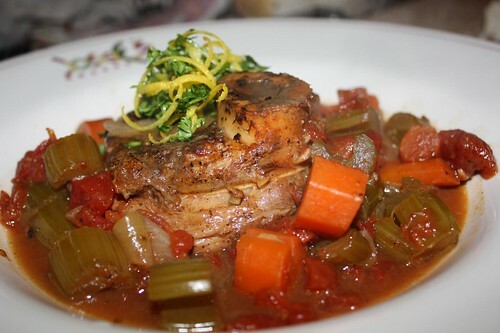 Once a year I like to make Osso Bucco. In our old apartment, even in the dead of winter when this dish is best served, this was often a bad move that lead to us having to open all our windows and still sweating for the rest of the evening. This year I had waited way too long in the season for this dish. In preparation I opened all the windows in our new apartment only to find that after two hours I had lost feeling in my fingers. Apparently our new apartment has this new technology known as ventilation. This means that we don't have to stop using our oven between April and Novemeber. An avocado was enjoying its retirement on our counter and was days away from joining the big guacamole bowl in the sky. 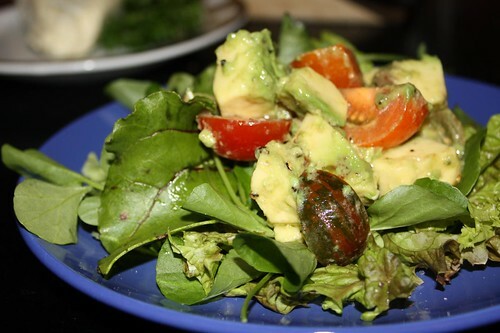 I took advantage of this situation and turned it into this salad using some baby heirloom tomatoes, beet greens, red leaf, watercress, lemon, and olive oil. For bread we enjoyed a little sourdough with this Fromage D'Affinois. Don't feel intimidated if you're not into cheese. Put simply this is cheese from Affinois. See? Learning about cheese is easy! 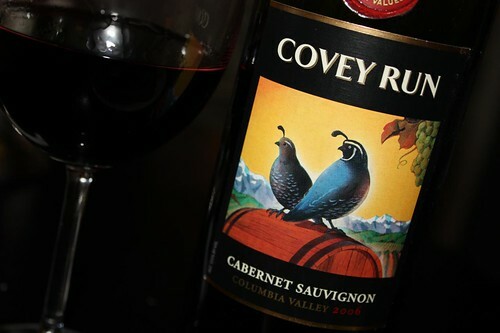 Jen received this bottle of Covey Run as a gift. Don't feel intimidated if you're not into wine. Put simply this is just a pair of birds and their young, or a small flock, that are running! See? Learning about wine is easy too! 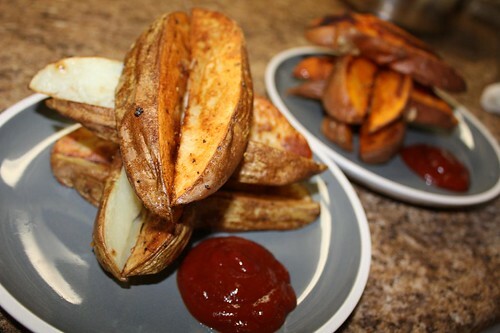 As an accompaniment for the final course I made potato and sweet potato fries. The restaurant I used to watch at served brabant potatoes as an accompaniment for osso bucco. While delicious they're quite wasteful as they involve throwing away about 30% of the potato. 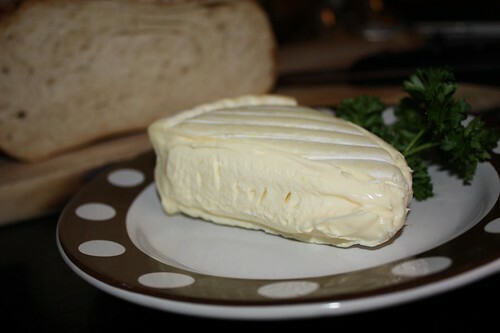 I much prefer this less precise version which also requires less butter and less fuss. I find the dicing of any vegetable these days to be more of an annoyance than anything else. I had a vision of doing something to put a spin on classic osso bucco but in the end I just did it the same way I always do it. It's hard to veer too much from tradition in these dishes I do once a year. I could have went heavier with the root vegetables if I'd taken the care to actually make this while it was cold out. However, since I was running out of time I just went ahead and made it Plain Jane style. Now that that's cleared out of the freezer it's time to roll full speed into Spring. Unfortunately it's a little too early for any of the necessary vegetables to really be ready. And with Spring approaching I'm reminded of the fact that we have not locked on to any local farm share at all. Most of the farm shares where we live now cost about as much per year as it would to purchase an iPhone for every man, woman, and child in the state of New York. If anyone has any leads on a reasonably priced farm share please drop us a line. We'll cook a vegetable dish and name it after you! I thank him so much for his kind words! However, I'm removing his link to what is likely some horrendous spam or malware.